In October 2016, St Paul’s School hosted a design symposium for Year 3 students. The objective of this event was to give the students the opportunity to apply design thinking to a real world problem. Taking the form of a two-day event, the structure of this symposium was an adaptation of the Two Day City program, previously hosted as a part of the Out of the Box Festival¹. This symposium had the potential to be a very valuable learning experience for the students so it was critical to make it as authentic as possible. 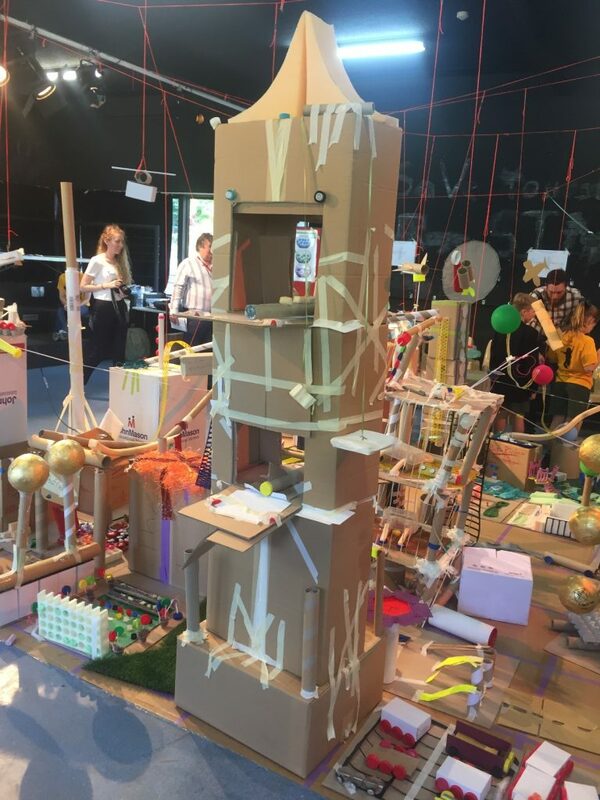 To support the Year 3 students, a variety of staff, older students, industry experts, parents and volunteers were invited to collaborate in the innovating and designing. Throughout the two days, students worked collaboratively, negotiating to decide what the most important aspects of a future airport were and then split into these groups. They settled on 10 groups which included security, transport and catering. Each group then developed their own set of guiding principles. The students discussed and negotiated with other groups with links in order to gain a better understanding of each other’s needs. Also, there was opportunity for a variety of leadership roles that involved role-playing, management positions and attending meetings to share their progress. By the end of Day Two, the students had modelled their creations on a scaled 6m X 6m map of the airport precinct using recycled materials from Reverse Garbage. They presented their solutions to family, friends and special guests. Each student spoke with great enthusiasm and confidence about the reasons behind the airport’s design and construction. More importantly, the students were able to articulate the critical thinking processes that went into the ideas and decisions that became their solutions. As a result of this experience, each student has increased confidence in his or her ability to work through a problem using the design thinking process to reach the best solution. These skills have naturally transferred to the classroom and teachers from a variety of disciplines have commented on the students’ willingness to ‘have a go’ without fear of judgement or failure. This significant personal growth of the students who were involved in the symposium was an unexpected but exciting result and broadens the spectrum of benefits of design thinking far beyond the classroom. ¹ A toolkit based on the Two Day City program can be downloaded here and adapted for your own design challenge. Justin Hill is the junior school Design and Technology teacher at St Paul’s Anglican School, Bald Hills and was appointed APDL Design Minds Regional Ambassadors in 2016. This article and video is an outcome of his work with APDL Design Minds program. Design Minds is supported by the Queensland Government through Arts Queensland.